We just received an email from CRAIN’S NY. It’s OK to love your work, screamed the headline. The folks at Crain’s went on to explain that they’re going to unveil the best places to work in NYC. Here’s a (not so) secret – you couldn’t pay us a million dollars to work at one of them. Sure, there were days, even months, back in the day on and around Madison Avenue, when we loved where we worked. We enjoyed shooting in LA, we didn’t mind hanging out with Drew Barrymore at the Sunset Marquis. But at this point, we think b+f would beat their winners hands down. Part of the reason we love our work is we love where we work. Our office overlooks Deep Hollow Ranch, less than a mile from the Atlantic Ocean. We work with a lot of business owners all over the East End, remember integrity, honesty, and kindness? They’re alive and well out here. Whether you own an advertising, marketing and web design business, a landscape company, a car dealership – you work at a local bank, newspaper, magazine, or hospital, you can’t beat taking a beach walk before, after, or during work! So, a few days after Thanksgiving and a few weeks before Christmas, Hanukah and Kwanza, we thought we’d say THANKS. There’s no better place to live or work than the East End of Long Island. 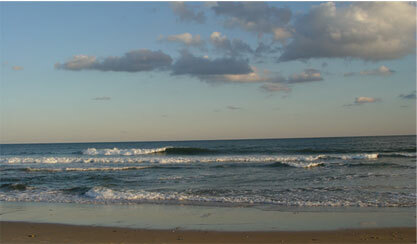 It’s Finally Spring in Montauk! Let’s talk. Call us: 631 668 0007. ©2019 blumenfeld + fleming, LLC. The Hamptons website design, web development, graphic and logo design, advertising, branding, and marketing firm serving the East End of Long Island, Montauk, East Hampton, Southampton and Riverhead. Work may not be used or reproduced without permission.